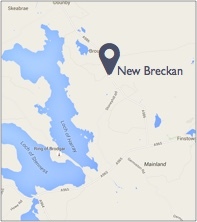 New Breckan cottage is easily found from both Kirkwall and Stromness. If arriving in Orkney by the ferry MV Hamnavoe from Stromness, take the A965 for Kirkwall road for approximately six miles, then turn left on to the A986 for two miles until you come to Fursbreck pottery on the left. New Breckan is the next building on the left before the turn off to Netherbrough. If arriving by Northlink Ferries on the Aberdeen to Kirkwall route, Short Sea Ferries John O'Groats to Burwick route or Pentland Ferries St Margaret's Hope route, or by aeroplane, follow signs for A965 for Stromness, from Kirkwall, for approximately eight miles, then turn right onto the A986 and follow rest of directions as above.